Rain, rain, rain. That’s all we’ve seen in California so far this year. I’m not complaining though. I’d rather have too much than too little. Within reason, anyway. Since the storm wasn’t supposed to let up for days, I chose not to let the moody weather keep me from sketching. 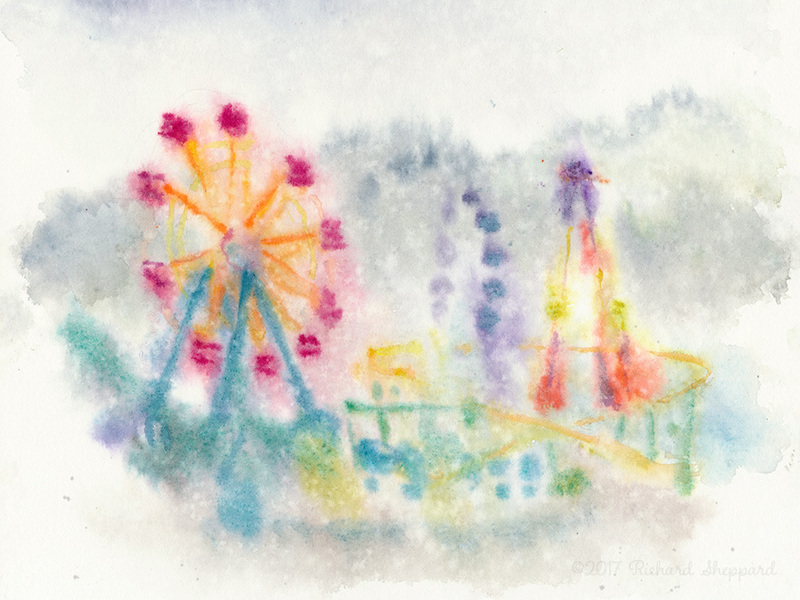 Bundled up in a raincoat and hat, I stood without an umbrella across the street from the fair and pulled my sketch kit from a plastic bag. Small droplets of rain blurred, splashed, and dotted my sketch. But it wasn’t long before the rain picked up and I hid under the overhang of an empty building to allow the paint to dry. Watercolors on Arches Hot Press paper. February 19, 2017 Richard SheppardComments are off for this post.